Noakes Farm Riding Centre01885 483467work Horse RidingSet just outside Bromyard in rural Herefordshire, Noakes Farm Riding Centre is a friendly, family-run registered riding school. 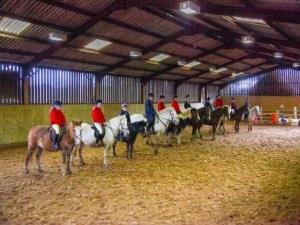 The riding school provides quality private and group tuition, pony club membership and school holiday fun days. Noakes Farm Riding Centre also welcome visitors who enjoy a riding break on their holidays or want to hack out in our glorious countryside. You can hack out in peace and tranquillity over our beautiful 250 acre farm of rolling hills and pasture land with woodland running alongside the River Frome. Explore the adjoining Herefordshire countryside (with the kind permission of farming neighbours) in a safe, relaxed, environment. Lessons are given in the outdoor arena which is picturesque as it looks over the farm. This is very suitable for children of all ages and adults to improve their skills in jumping, dressage, games, etc. with a great feeling of security. The horses and ponies are tacked up in our covered barn which is ideal should the weather take a turn. We have a large tackroom which is fully equipped with lecture room and toilet. The stabling block is a peaceful place for the horses and ponies, set in traditional stone, with a relaxed outlook onto the farm. From Bromyard, head towards Leominster on the A44 for 1 mile. As you descend down the hill over Noakes bridge turn right for Noakes Farm Riding Centre as signposted. This drive will bring you straight up to the farm.